Lady Dame Honor Harrington - starship captain, admiral, Steadholder, and Duchess - has spent decades defending the Star Kingdom of Manticore against all comers. Along the way, she has become the legend known as "the Salamander" from her habit of always being where the fire is hottest... and also from being a national best seller (Ashes of Victory). But it's a big universe, and Honor's actions affect a lot of lives, not all of them human. And their actions affect her - a lesson "Ms. Midshipwoman Harrington" learns years before rising to command rank, when a desperate battle against "pirates" who aren't quite what they seem begins her brilliant career. 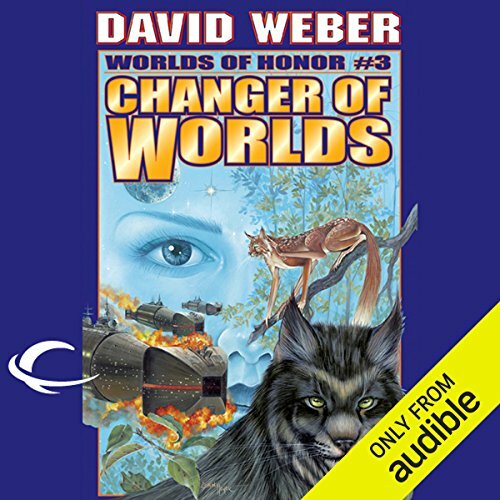 Closer to home, in "Changer of Worlds" a secret that the alien treecats have kept from their human friends for hundreds of years is about to come out... and completely change the relationship between the two species forever. Meanwhile, Eric Flint weighs in with "From the Highlands". Honor can't be everywhere, so when the People's Republic of Haven tries to stage a political assassination on Earth, Anton Zilwicki - husband of one of the Star Kingdom's most revered military martyrs, and father of a young woman who is clearly a chip off the old block - steps into the breach... and takes the opportunity to settle some old scores along the way. And finally, Esther McQueen and Oscar Saint-Just square off for their final confrontation in Noveau Paris in "Nightfall". ©2001 David Weber, Eric Flint (P)2012 Audible, Inc. I personally like the Honor Harrington series. It is military science fiction. This is not usually my favorite genre, but this series is well written. This book contains great short stories that fill in Honor's background or flesh out that universe. Good stuff. Honor Harrington's Midshipman cruise, I do not have to tell you that it was funny, exciting, interesting and deserves FIVE STARS. "That looks like your snotty, Senior Chief." The Marine sentry's low-pitched voice exuded an oddly gleeful sympathy. It was the sort of voice in which a Marine traditionally informed one of the Navy's "vacuum-suckers" that his trousers had just caught fire or something equally exhilarating, and Senior Chief Petty Officer Roland Shelton ignored the jarhead's tone with the lofty disdain of any superior life form for an evolutionary inferior. Yet it was a bit harder than usual this time as his eyes followed the corporal's almost invisible nod and picked the indicated target out of the crowded space dock gallery. She was certainly someone's snotty, he acknowledged without apparently so much as looking in her direction. Her midshipwoman's uniform was immaculate, but both it and the tethered counter-grav locker towing behind her were so new he expected to hear her squeak. There was something odd about that locker, too, as if something else half its size had been piggybacked onto it, although he paid that little attention. Midshipmen were always turning up with oddball bits and pieces of personalized gear that they hoped didn't quite violate Regs. Half the time they were wrong, but there would be time enough to straighten that out later if this particular snotty came aboard Shelton's ship. And, he conceded, she seemed to be headed for War Maiden's docking tube, although that might simply be a mistake on her part. Do you remember when treecats moved to Grayson? This story gives us the reason for "immigration" and gives interesting insight into Treecat politics and customs. The story takes place on old Earth. and many more, but just mentioning their names will be a SPOILER. BTW we already encountered Anton Zilwicki and his daughter once before, I will leave it up to you to remember when. Once again in the end we have a marginal story, but perhaps the story of Esther McQueen's and her coup attempt would be interesting to you. NEXT BOOK IS " Echoes of Honor"
The Eric Flint story alone is worth your credit. This tells the story of Esther McQueen's attempted coup. I don't particularly like the long passages in Weber's novels which take place among the people of Haven, so I have chosen not to listen to this story. This is a collection of short stories that fill in some of the gaps in the Honor Harrington series. You must have read the series or else you will be lost. The first book in the HH series starts with Honor as captain of her own ship. This story tells of Honors "snotty" cruise as a Midshipman. We can see the beginnings of her development into a great naval officer. Glad that they kept Allyson Johnson narrating the story of Midshipman Harrington. Johnson is the voice of Honor Harrington. The short story about the tree cats tells about when Harrington returns to Sphinx and Nimitz takes Samantha to meet his clan and encourage some of them to follow him and his kittens to Grayson. In the series it never explained how they got the other tree cats to come with them. "From the Highlands" tells the early story of Anton Zilwicki and daughter Helen. In the series we saw the death of Anton's wife Captain Helen Zilwicki who is escorting a convoy of Manticor ships (one carries her husband and child) when the PEEP hit the convoy. Helen (daughter) is kidnapped in this story (often referred to in the series) and the Countess or Tor, Anton, Jeremy X and Victor Cachat rescue her. We are introduced to Berry and Lars who was featured in another sub-series. The last short story is about Admiral McQueen"s over throw of Oscar St Just's PEEP government. All stories fill in information to the main series and also leave room for lots more stories. All the narrators did a good job. This book is a great fill in to the back story and alternative points of view of the events in other Honorverse books. Here is my complaint: The last narrator - L.J. Ganser - although a good reader is either correctly or incorrectly pronouncing one of the main character's names. I assume since he is the one who is pronouncing it differently, that he is the one pronouncing it incorrectly. This is annoying and truly interrupts the story. Besides that - this is a quality production and well written. Honorverse fans like myself will enjoy this one. This is a good book, for the people who have already listened to the honor series by David Weber. It fills in spots and gaps that were not fully covered in the series. Lots of fun details about what happened elsewhere in the main story. I especially enjoyed from the highlands. Good to read before the wages of sin series I think. All of the Worlds of Honor Books are nice sources of background material that is left out of the main storyline. It is important to note however that it works best if you read the individual stories at the right point of the storyline. One thing I thought especially nice in particular regarding "From the Highlands" was the use of Male and Female narration based on POV character, something I devoutly wish they had done in the main series.